A small dividend boost pushes the telecom's yield even higher. 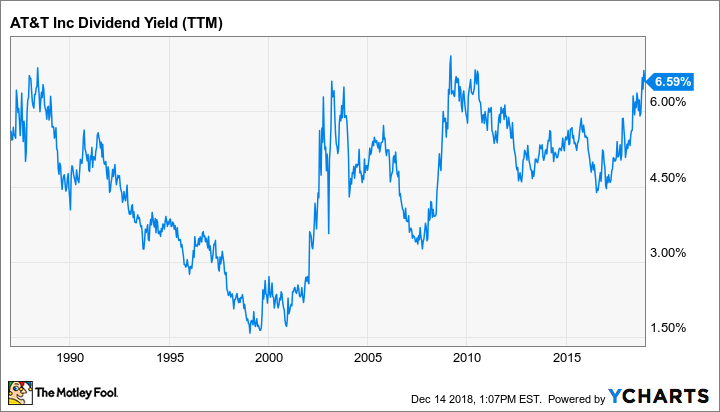 With AT&T's (NYSE:T) dividend yield already close to an all-time high, the result of a steep sell-off in the stock this year, the telecommunications giant sweetened the deal ever so slightly on Thursday. AT&T announced that it was boosting its quarterly dividend to $0.51 per share, a 2% increase. 2018 now marks the 35th consecutive year the company has raised its dividend. AT&T's forward dividend yield now sits at a sky-high 6.75%. The last time AT&T's dividend yield approached 7% was in the aftermath of the financial crisis a decade ago. Before that, the dividend yield surged above 6% in the aftermath of the dot-com bust in the early 2000s. Prior to that, you'd need to go back to the 1980s to find AT&T sporting a yield comparable to today's. T Dividend Yield (TTM) data by YCharts. The dividend is a big reason why investors are drawn to AT&T. 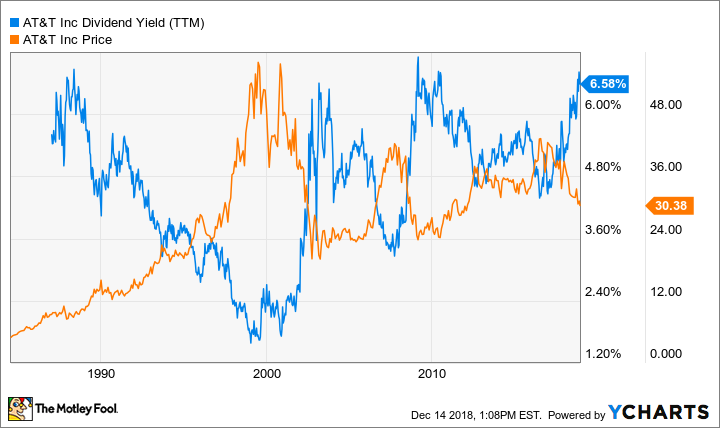 One way to get a sense of whether the stock is cheap or expensive -- albeit a very imperfect one that ignores earnings, cash flow, and the balance sheet -- is to look at where the yield is relative to historical values. Each time the dividend yield shot above 6% in the past, a rally followed. 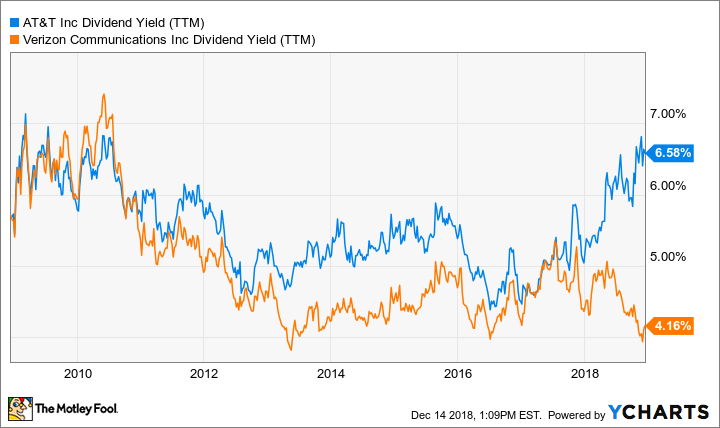 It's also useful to compare AT&T's dividend yield to that of Verizon Communications, the other giant U.S. wireless company. For much of the past decade, the gap between the two stocks' dividend yields has been relatively small. But they've diverged since the start of 2018, and the gap is now at its widest point in many years. That suggests that AT&T stock is quite a bit cheaper than Verizon stock. Shares of AT&T look cheap, and the dividend yield is historically high, for good reason. The company has piled on a mountain of debt over the past few years while acquiring its way to a media empire. A $67 billion deal for DirecTV was completed in 2015, followed by a massive $110 billion deal for Time Warner that closed this year. AT&T issued new shares to pay for some of both deals, but they still required a gigantic amount of debt. At the end of the third quarter, the balance sheet featured an eye-popping $183 billion of debt. That's up from just $75 billion four years ago, before the debt-fueled buying spree. AT&T is now paying around $2 billion each quarter in interest. AT&T generates a ton of free cash flow, so this debt load is manageable for now. The company is expecting free cash flow to be around $26 billion in 2019, with dividends eating up just short of 60% of that total. That leaves plenty of cash left over to chip away at its debt. AT&T expects to reduce its debt by as much as $20 billion next year, funded by $12 billion of its free cash flow and as much as $8 billion raised from real estate sale leasebacks, noncore asset sales, and working capital initiatives. But there's now a lot more that can go wrong and a much narrower margin for error. The $2.5 billion in synergies that AT&T expects to eventually realize from the Time Warner deal could end up being overly optimistic; the company's plan to leverage its new assets to expand its streaming business may not succeed; and the core wireless business could face stiffer competition and slimmer profits. Debt makes a company more fragile; if there's a recession in the next couple of years, AT&T will enter it with a scary amount of debt. This doesn't mean that AT&T can't be a good investment. The stock trades for a bit more than eight times its expected 2019 free cash flow, a valuation that already reflects a lot of pessimism. And the latest dividend boost makes AT&T an even better deal for dividend investors, pushing up the yield close to record highs. The best time to buy a stock is often when no one else wants to. With shares of AT&T down more than 20% this year, it certainly checks that box. Having said that, the stock is riskier than at any time in the recent past thanks to the massive debt load. Keep that in mind if you're looking to add this high-yield stock to your portfolio.